Thread: who got the best deal on their bikes? alright let me preface this by saying i am cheap. or stingy. or i hate to spend 3-4k on ONE bike. but i would like to see pix and descriptions of you bikes and how much you put into it. 1. 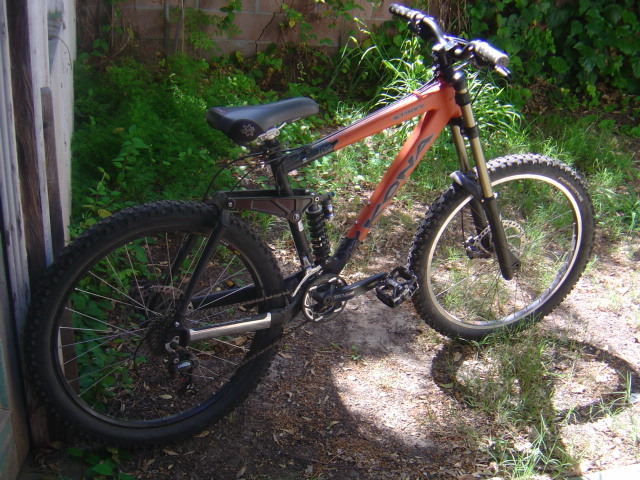 2003 iron horse sgs. i bought the frame, shock, rear wheel, cranks, seat post, headset, cassette, pedals, tires for 550; added a 03 boxxer team with black box upgrade for 300; brakes, wheel, stem, bars, mrp, etc i paid another 350 (and that includes brakes from 2000, but they are on the kona;i swapped em). so thats $1200 for a sweet dher. only the handlebars were bought from my sponsor. 2. 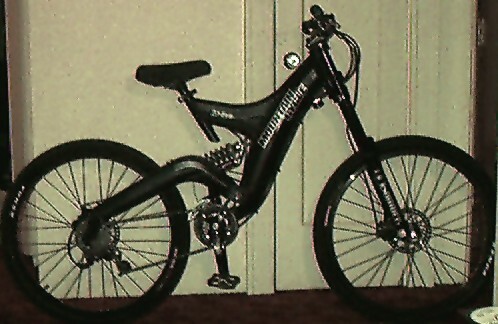 2003 specialized p.1. bought the frame, chain, post and wheels for 150. fork (03 dj1) got for 165. the other parts (brakes, tires, bar, stem, grips, cranks, pedals, bb, headset) totaled 200. so i paid 515 for my killer dj machine. only got the fornt tire from a sponsor. 3. 01 kona stab. ita retailed for 3250 with lx, mr dirt guide. 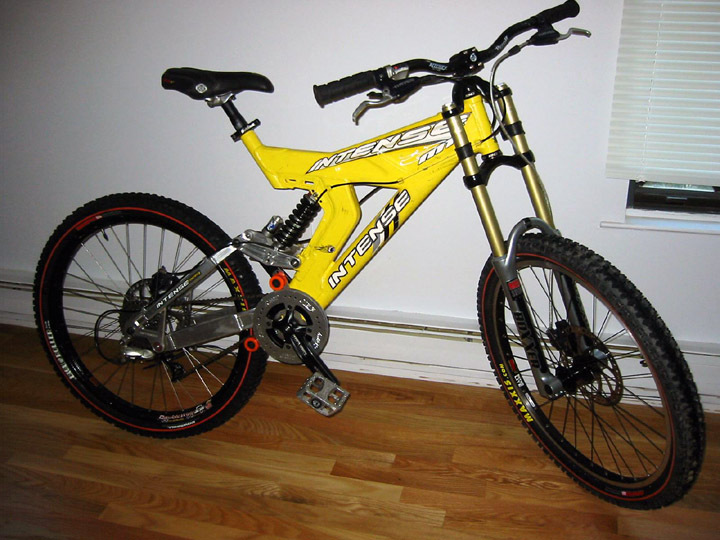 i got it for 2200 with mrp and xtr from a bike store going out of business in jan 02. it cost 50 bucks to upgrade the 01 super t to a 04 z150. 50 bucks for a swap to front der. capability and i have 2300 in it. the fork was bought from a sponsor. so that $4015 for three rides that all kill it. the retail price of the three bikes run about 6800-7000. i did get great deals on a fork, tires and handlebar from my sponsor, but most of the three bikes are just deals i found. I got a stock KHS DH50 without forks...bought some USD 180's and the full DH bike was $850 with tax+shipping (Retail is $2400). Now THAT was a deal! 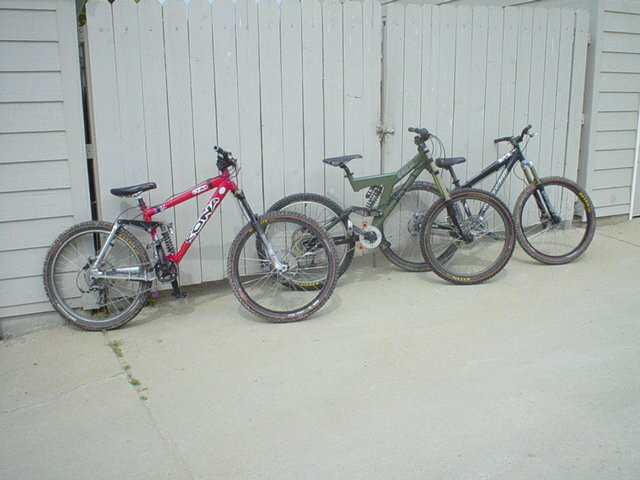 2003 Cannondale Jekyll 1000, was $2600.00 I paid 1475.00 brand-new. 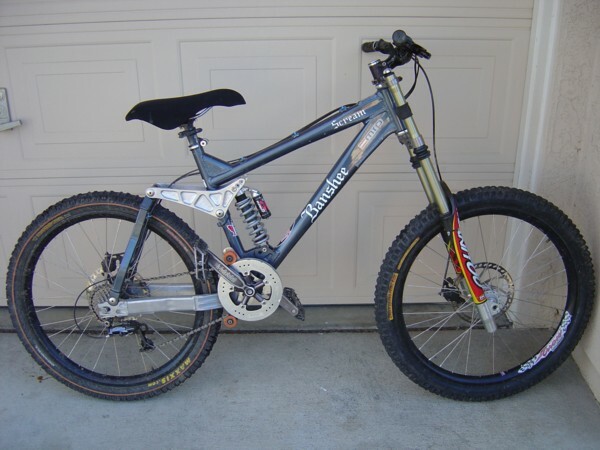 2004 Specialized Demo 9 Pro, MSRP 4120.00, On sale for 3800, I paid 3230.00. Both deals were at SuperGo. You can get a pretty good deal there IF you talk to the right people. Some of the guys who work there are really cool and some are total pricks (typical of LBS's) so choose your salesperson wisely. 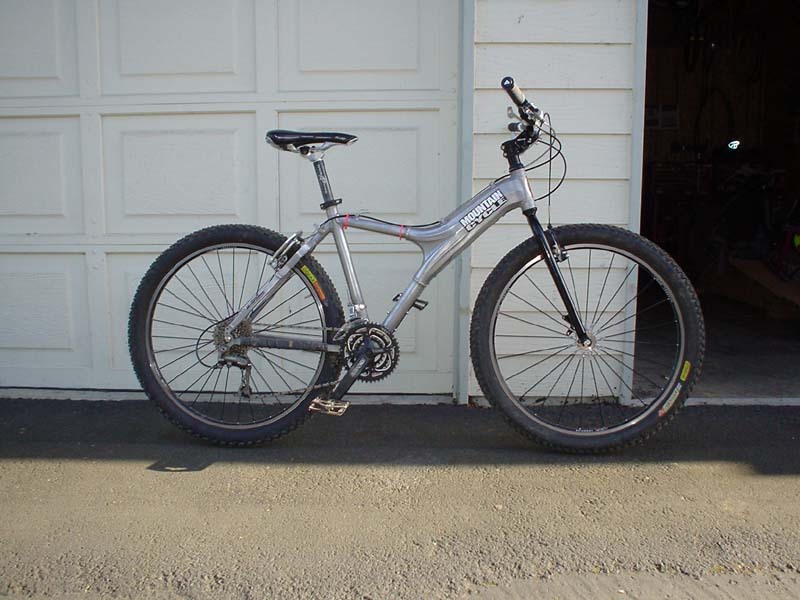 03' Specialized Big Hit Expert purchased April 1, 03 for $1700.00 (thank you V ). Also big thanks go out to Supergo and the Evil one. wow.. I must say, I am impressed! You must have like looked and searched on ebay, mtbr, and all over the internet for days and hours to find such good deals. Your Kona head angle looks more slack than your DH bike. That's not right! I got a 2003 Bullit for $1700, brand new. I bought a 2001 M1 off these classifieds for $1200, but put a lot into it. "You want bread? TWO DOLLARS!" Well as most of us know I just got a barely used 03 V-10. Spent $2300 complete on it. I have a question, regarding your signature, that's been bothering me. What does it mean exactly?? I have an idea, but I could be way off. I got the best deal on my new bike, an '04 Mountain Cycle Sin. OK BJ, I know you like stealth black so maybe this one is a little easier on your eyes. ROFL! It's from Seinfeld. That episode was awesome. Haha! Makes me laugh just thinking about it. i think its actually a slight bit steeper or the same. the kona is on a little rise in the pavement there so its pointed uphill. i did spend some time over the last few years searching for deals but not too much. What? I got the impression you HATED my polished 9point5. Anyway how can you see this bike? I thought you were blind? Jaho say's, Go eat a vegimite sandwich and screw a kangaroo! Screwing kangaroos is OK, Tony? I guess we should ask BJ. As long as BJs getting it on tape for your guys's future parties to show friends. Lol, just messin. If I was in australia I'd so be stealing your bike after that comment, lol. Oh no! What did I start? Really I need to go to sleep, it's 12:38am here. I gotta get up early and go out and try to break that BEAUTIFUL black bike. If you want to make fun of an ugly Mountain Cycle check out Jaho's ride. Just from my favorite Seinfeld episode. That's all. blkmrkt frame free, fox talas rl free, saint everything free, singletrack wheels $150, Tioga bars and stem free, everyhitng but the wheels free. Atomlabs coming in teh amil that were free. Unfortunately no pics yet, since my digital camera got dunked in the river the other week! Took the XT drive train, front wheel, and fork from my ATX-890. I bought a custom-made 2000 Z1w/QR20 for $150 for a few years back, and had an entire XT/LX build (w/ Titec, WTB) that I got during the glory days of the internet for ~$300. All in all I have ~$1200 invested in the Bullit. Next purchase is a shorty stem and burlier handlebars to replace the Monkeylite XC/Koski stem. The ATX-890 should be built up for singlespeed trail by September. I'm calling you out! Those who have their bikes listed on Light-Bikes. What's the big deal about Reynolds Park?